The tapestry on the walls of the Cathedral of Our Lady of the Angels in Downtown Los Angeles, California reflects the diversity of the Catholic Church and the Faith. 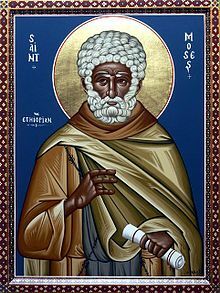 Moses the Black’s Feast Day is August 28, an Ethiopian hermit and martyr born into slavery, he was driven out because of his violence and evil. He was a leader of an outlaw band and hide in the Egyptian desert of Skete in the Delta region. Moses the Black had many supernatural and mystical gifts. Moses the Black became a Monk at Petra Monastery, was ordained by Theophilus of Alexandria. He was slain with six companions by Berbers, he refused to defend himself.